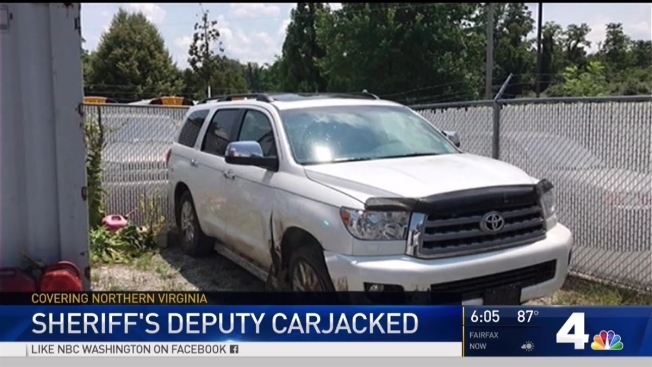 Clarke County and Loudoun County, Virginia, investigators are looking into how a Loudoun County sheriff’s deputy was robbed of his service weapon and carjacked after giving a man a ride. News4's Julie Carey reports. Clarke County and Loudoun County, Virginia, investigators are looking into how a Loudoun County sheriff’s deputy was robbed of his service weapon and carjacked after giving a man a ride. Police said Zakareea Alzanam, 22, stole the deputy’s weapon and his personal SUV after the deputy gave him a ride early in the morning of July 12. They said the deputy dropped off Alzanam at a convenience store near Route 7 near Berryville in Clarke County and realized his cellphones were missing. Investigators said the deputy, who has not been named, returned and confronted Alzanam about the alleged theft. They said the suspect stole the deputy’s service weapon and carjacked the deputy’s vehicle. After the deputy called 911, police discovered the crashed SUV along Route 7. They said a community alert was issued in Clarke County for Alzanam, who had fled the scene. Police said three men working on a cattle farm spotted the suspect, but Alzanam fled to a nearby house and jumped into an unlocked car. Officers surrounded the car, and Alzanam surrendered without incident. The suspect is being held without bail, and police said he was on parole for a crime in New York state. The Loudoun County Sheriff’s Office has started an internal affairs investigation. They said the deputy was off-duty and on sick leave at the time of the incident.